We’ve recently written about consultation in the North and South about future transport networks as part of a project to designate the corridors before the growth starts occurring. Back in August they consulted on Warkworth and in the North around Dairy Flat and Silverdale. Earlier this month they consulted on the South from Takanini through to Pukekohe. The consultation for the final area, the Northwest, closes tomorrow. Over the coming three decades there is expected to be another 75,000 people and 25,000 jobs in the Northwest. The biggest single transport piece is likely to be light rail that the government have committed to. There is no exact suggested corridor yet but it’s likely to roughly follow the current route of SH16. The work that the NZTA are meant to be doing on this project should eventually feed into this piece of work. The project alliance are also once again looking at the options for extending the heavy rail network from Swanson, which they say will “take into account decisions made on light rail and the future of rail freight between Auckland and Northland“. From memory the last time it had a very poor business case with a benefit cost ratio of about 0.2. They will also look a little more deeply than has been done before at the proposed Upper Harbour busway which would connect between Westgate and Constellation Dr. For the next few decades at least, this will likely just mean ensuring any other upgrades to the corridor take the need for a future busway into account. There are two ferry terminals being considered for the long term. Whenuapai – This would also have the “Notable environmental constraints” and also would need to operate at slow speeds in the upper harbour. This doesn’t seem practical compared with a feeder bus to a light rail station. There are a number of state highway related projects expected in the coming decades. Likely the biggest of these will see SH16 realigned to bypass Kumeu-Huapai. I don’t have too much issue with this as with the population growing so much it should see the town centre become more urban people focused and so taking the state highway out of the middle of it will be important. The don’t explicitly state that this new route would be a motorway but I’d be surprised if it wasn’t given the already decent traffic volumes. The new route will be on the southern side of the town and has been split into two halves. Each of those two halves has two route options with each side mix and matched. Below are some of the positives and negatives they give for each of the four lines. Would require realignment of the proposed interchange at Brigham Creek Road. Integrates with the safety and efficiency upgrades already being delivered on this section of road by the Safe Roads SH16 project. Provides more direct connectivity with the future growth areas and existing business areas. 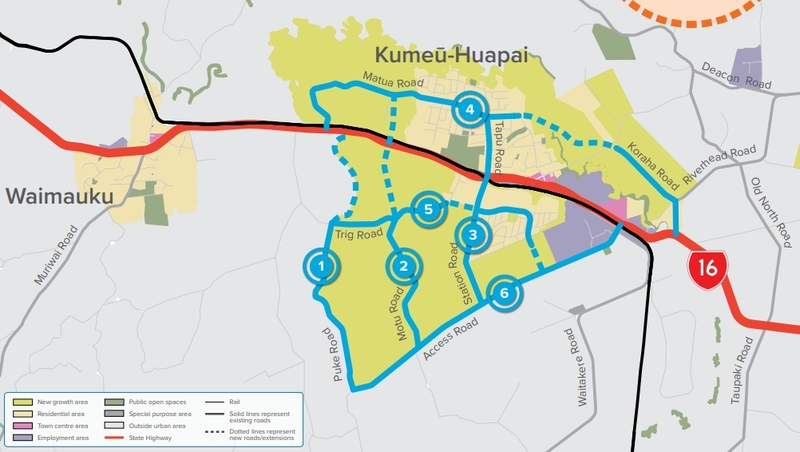 There are four focused areas listed where new urban arterial networks will need to be created, These are Redhills, Whenuapai, Riverhead and Kumeu-Huapai. There are a number of new (green) and upgraded existing (orange) arterial roads listed. The one where there is some uncertainty (1) is the western most North/South route. Option A would upgrade the existing Nixon and Taupaki roads and links into SH16 at the existing Taupaki intersection but is further away from where future housing will be. Option B is away from both existing and new housing which they say could potentially make it a limited access road – so no driveways or intersections off it. That would join in to SH16 at the Coatesville-Riverhead Highway. One of the benefits of the proposed Northern leg of the SH16-SH18 interchange is it reduces vehicles on Brigham Creek Rd and would make it easier to detune. They are questioning if it should have a partial detour but that would take it away from the village. At Riverhead one of the big focuses will be upgrading Coatesville-Riverhead Highway for safety. Like with other roads and those in the other consultations, they say this could be for PT too but this feels a little like PT washing unless there is a sensible bus route to run over it – a future north/south route from Riverhead to Redhills stopping to interchange with the future light rail might work. There is also new and improved roads to link up Riverhead with Kumeu-Huapai and Whenuapai. 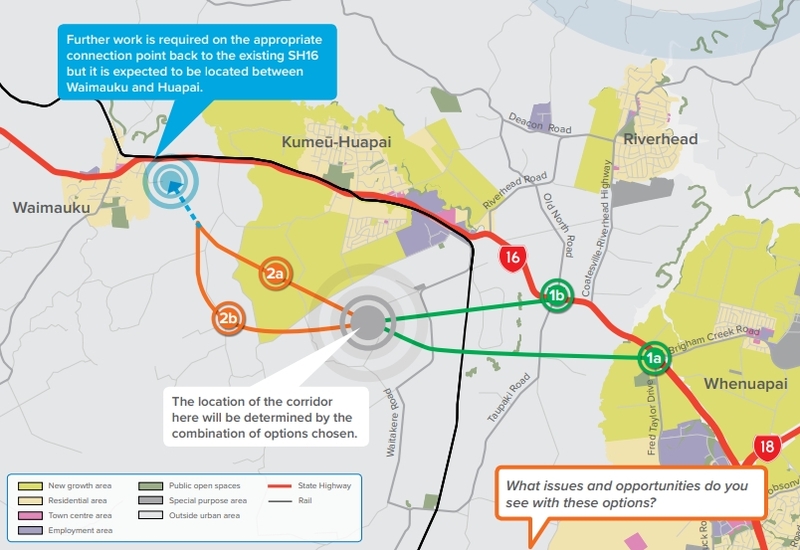 There aren’t the options presented for Kumeu-Huapai, just that they’re considering these routes. We are very good at looking towards the future and far less good at dealing with the present, especially in the northwest. Last years New Network changes were a big step backwards for anyone further out than Westgate wanting to bus anywhere other than lower Cbd. PT patronage in peak has barely grown vs rapid population and traffic growth. Where is the work on making a decent platform to build a future on ? You have your fellow residents and local businesses to thank for that. 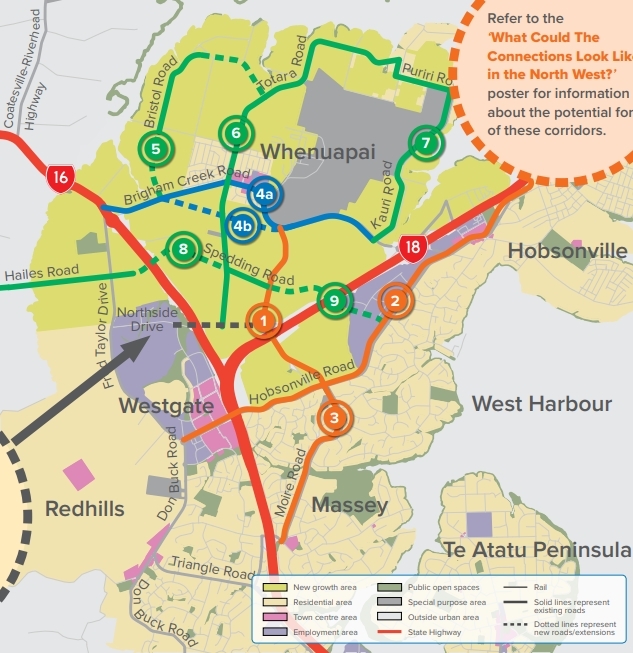 AT have big plans for the Northwest with new interchange stations at Westgate and Te Atatu, which would have enabled much better frequencies on the buses and a wide variety of connections across the west, north shore and city centre. Unfortunately they were fought every step of the way, and the locals got exactly what they fought for. What was the story, Dorian? What was the resistance about? Disagree – at least in terms of Te Atatu. NZTA were working on the motorway and as part of widening they would remove a number of houses, to get local residents to support this move they had them sign up to an agreement whereby the area with houses moved from would be planted with trees and landscaped etc. They signed -later and with no knowledge of local board or MPs – Auckland Transport said they were going to put a bus interchange on the site which their spokesperson described as ” not great but its what you are going to get”. The location meant buses would have to make a number of turns across traffic to get in and out of interchange and adding considerable time on the bus journeys – buses having to come off the motorway and battle through traffic, pick up at interchange and repeat. The public meetings were all positive about an interchange and PT but asked for something more than a quick poor fix. Correct, not a perfect-world outcome but the best they could do. Locals fought it and now they have no bus interchange at all. Did anyone suggest a better layout for the bus movements? Or is tacking on bus amenity after the roads have been designed for cars the problem here? Yes a better layout was suggested- and AT look like they are going to actually try and do something that will create an interchange that works. I checked my notes the AT spokesperson described theire original plan as ” inelegant but it’s what you are going to get”. As I said earlier all the meetings had vast majority of community supportive of a bus interchange and better PT the back of an envelope option that was trying to be pushed on the community with obvious flaws – one estimate was buses taking an additional 10 minutes from leaving the motorway to rejoining it and poor access for locals to walk or ride to it. So in other words: Please accomodate the bulk of the growth in West Auckland because the residents of the inner city suburbs like Grey Lynn & Pt Chev don’t want proper density on thier frequent transport routes, but we’re also not going to offer you a proper transport solution and expect you to stump up for half-arsed answers to problems we’re going to lump you with. Quite right to bring the Inner West Heritage Museum into this discussion, Buttwizard. Heidi – the way I see it, the intensification should happen from the inside out first and foremost. What on earth was council doing? They have the business association in favour of the development, and still buckled to some sort of NIMBY mindset. Possibly because the people making the decision have the NIMBY mindset themselves? I don’t know any of the people involved – does anyone know what went on there? It’s so backward – and disrespectful towards the people suffering from our housing crisis – it’s painful. Meanwhile we have the problem of the need for homes now and the need to stop building the roads now. I’ve told you some of my ideas for that – and I think the more radical we go, the better, at this stage. Additionally, I think in areas like Pt Chev, which saw some infill for a few years, but since then has only really seen MacMansioning, that there are sufficient large homes. I’d support a move like a (hundred thousand dollar?) development contribution payable for any extension larger than, say, 25 m2. It could shift people to consider adding homes instead. Geoffrey, you have nailed it and are absolutely right that ridership increase is not keeping up with population increases. Increasingly I have realised that the answer lies not with AT, but with government. First, AT clearly don’t have any solutions, but most importantly only government has the money to make meaningful and transformative change. A significant lowering of public transport fares is likely to significantly lift demand; which in turn would put pressure on AT to provide more frequency and better timeliness of services; and is likely to cause money to be diverted away from car based solutions. As the Productivity Commission says the current funding model is skewed towards roads and cars and only fundamental change will alter this. Question: What evidence shows ridership is not keeping up woth population growth? From what I understand, population growth in Auckland is running about 2% whereas ridership growth is about 4%. So … on average ridership growth exceeds population growth, which is why our per capita PT usage has increased over time. Geoffrey’s comment, to which Taka-ite was replying, was about Westgate. In our city of two halves, the ridership per capital in different parts of Auckland would be the important measure. Do you know what we have for the Westgate area, Stu? We’ve certainly seen the boardings at stations in competition with the SH1 (eg Te Mahia) drop after the WC opened, which freed up SH1. Westgate will be more complicated. Overall in Auckland, PT/capita is rising slowly, but has a long way to go before we’re at pre tram-removal days, and success would have to also involve reduced vkt/capita and reduced carbon emissions. Both those are rising. How does this align with the GPS? Safety, access, environment and value-for-money – none of these goals are being met, due to the induced traffic from these roads. I agree with Geoffrey, they need to act now, on public transport. They need to make as many lanes on the motorways and arterials bus lanes as are needed, now, to ensure that journeys are faster by bus than by car. Let’s not pretend we’re making good progress with cycling infrastructure – these growth networks are going to undermine all that progress. You can’t have a safe cycling network when everywhere cyclists have to cross traffic, there’s more traffic. The Dutch and Danish say you need to reduce the traffic, yet here we are increasing it. Blind! The walking and cycling network proposal should have some major cycleways that are not just part of a motorway or arterial, and those that are, should be separated sufficiently for air quality purposes. Couldn’t agree more. This is a prime opportunity to get things right from the start. We could have the correct priority and scale for all modes. This proposal looks like the assumption is that residents are all going to drive everywhere, including the local village. Currently they have to. It’s not a flawed assumption if you’re going to make it impossible to do anything but drive. The SH16 plan seems to be missing north facing ramps at Westgate. It is a Metropolitan Centre, the thing you are supposed to connect to. I guess they’re not trying to stop the tide of King Commute. What if a newly collaborative transport agency was quietly working with a rail organisation and a local transport body and a port working group and they came up with a plan to include a 16m wide rail designation with the road bypass of two north western population centres to allow the north and south sides of those centres to grow together to their full potential whilst also enabling growth in north south rail freight and passenger services to towns W and H instead of to towns K and H.
I think he was suggesting the railway would be realigned along with the SH16 bypass, reuniting the two sides of the township. I thought it was a suggestion that the Kumeu Riverhead line was to be reinstated and the port authority would have a container terminal at Riverhead. I’m just excited by the thought of a newly collaborative transport agency, and didn’t get much past that. This is exactly the type of road project that simply induces more traffic. Build a bypass and another town further away becomes closer to the city. So people move further out with their cars. Repeat, repeat, repeat and you get Auckland now. Priority needs to be mode shift. Sooner. Priority needs to be transport that people can actually use. I’m not going to use a cycle way if it means a 90 minute bike ride to work each way just because someone else thinks I should. They’re talking 25,000 jobs out there as well, not everyone is going to have a long commute. Also there will be many school kids travelling to school. There would definitely be value from a quality network of on-street cycleways. Mode shift includes PT. Includes biking to high freq PT. Everything but cars in Auckland at the moment. Basically we do not need more road projects in Auckland. I think we should just stop RIGHT NOW! Shutdown! Only maintenance. The Te Atatu example Dorian and Vinny discuss in the comments beg questions about these proposed growth projects: Are they designed around the bus movements and cyclist movements in the first instance, with car movements accommodated around them? Or is it business as usual? The Hobsonville population is growing, yet the ferry has long suffered from low frequency and poor off peak service. The bus service is also very poor which more than an hour journey time to city. For a newly ‘mastered planned’ development, this is an epic failure. I’m a little surprised that the Red Hills plan hasn’t resurrected the former WCC Western Bypass proposal, connecting Summerland Dr to Waitemata Dr and continuing it to Red Hills Rd. That would link Red Hills to rail at Ranui, and the new subdivisions around Swanson to Westgate. It would also allow a plan B for eliminating the Metcalfe Rd level crossing. Sprawl is ruinously unaffordable, both economically and environmentally. We have to stop. Auckland must have firm edges outwards and much more open ones upwards. Yes. The only chance Auckland has to avoid ‘mullet’ inequity is to force a rethink on the growth plans. It’s stupid to tinker around the edges with a bit of PT here and a cycleway there, and not campaign to prevent so much money being misspent on the things that will undermine any good progress. Totally agree. But in the meantime, I might buy some rural land between Kumeu and Whenuapai and wait for it to get upzoned in 20 years time…looks like a good investment. Looking at recent aerial images, It looks like business as usual. You already see blobs of generic sprawl coming up. Are there a lot of shops already in Kumeū and Huapai? Or is everyone expected to drive to Westgate for everything? Kumeū is about 30 km from the CBD and 10 km from Westgate. If development happens over there the smart thing to do is to design it as a town, not as a suburb. That town would be large enough to be an anchor on whatever rapid transit line is going there. Otherwise leave it. And what does the Unitary Plan show: big swathes of single use low density housing, and another swath of single use commercial zoning, and some single use industrial. Oh well. Kumeū has a new world, a Toyota service facility, etc. It’s quite developed. The biggest constraint is the road running through it and that there’s rail but no trains. At the moment, the plan is just business as usual and the outcome would be another sprawl car dependent suburb. The whole area needs a TOD plan. It should first identify a few transport nodes, then zone the land around it to be higher density. The land adjacent to transport node should zone for mixed used. Land that is very close to the transit node should be Terrance housing. Land that is walk-able to transit node should be zoned for Mixed housing urban and suburban. Also plan ahead some walking and cycling network inside the infill to connect the residences to the transit nodes and local amenities. Any infill subdivision must provide that linkage. After we got the transit nodes, we can design a rapid transit network around that. Also build bus lanes along the rapid transit network ahead. No. Maybe the areas in the inner city with things like Link Buses should be doing this first before you go dumping tens of thousands more people in the exurbs. Yes. But if they are going to put people there, Kelvin’s ideas are right. Agree, but this is no reason not master plan Kumeu as a Transit Oriented Development. The B route through Redhills, alongside the town centre, would bisect it and tend to isolate the halves. As an interested Westie, wasn’t aware this consultation was happening. There seems to be no dedicated bus right of way or bus ways. There are a few possibilities. 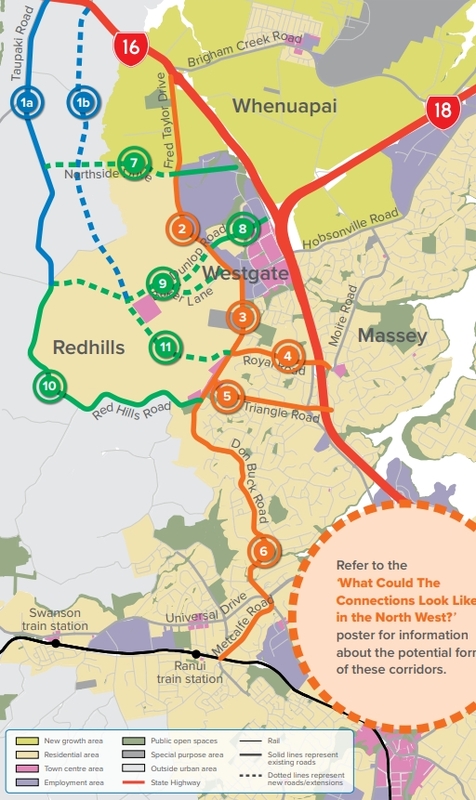 On the Redhills page, for example, it says “the following existing arterial corridors may be upgraded and extended for either general traffic or public transport”. Which is better than in other parts where “upgrades to traffic capacity” are mentioned. 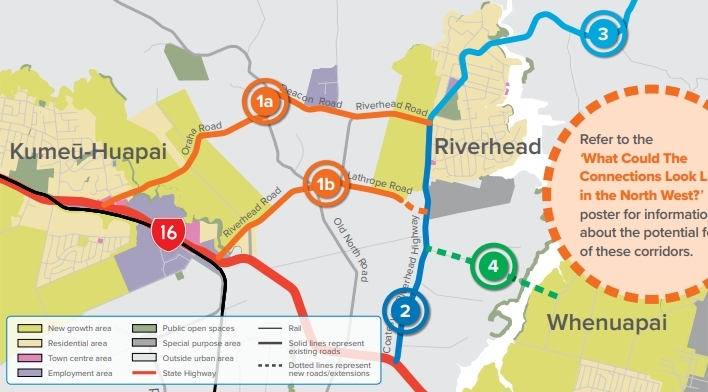 At a stretch, the new Riverhead – Whenuapai connection might be a busway: “Could be a walking and cycling only connection, or could be a combination of traffic, public transport facilities, and walking and cycling”. It all reads as PT-wash and Bike-wash to me. The design is around the car movements first – that’s what all the improved connections are; anything else “may be an opportunity”, or in reality, will be designed around the car connections first. Heidi – It seems that NZTA is still not taking bus right of ways or dedicated bus ways seriously when designing road improvements in the Auckland region. I thought with the upgrade of the North Western Motorway, they would have learnt that but it seems they haven’t. Kris, I agree. 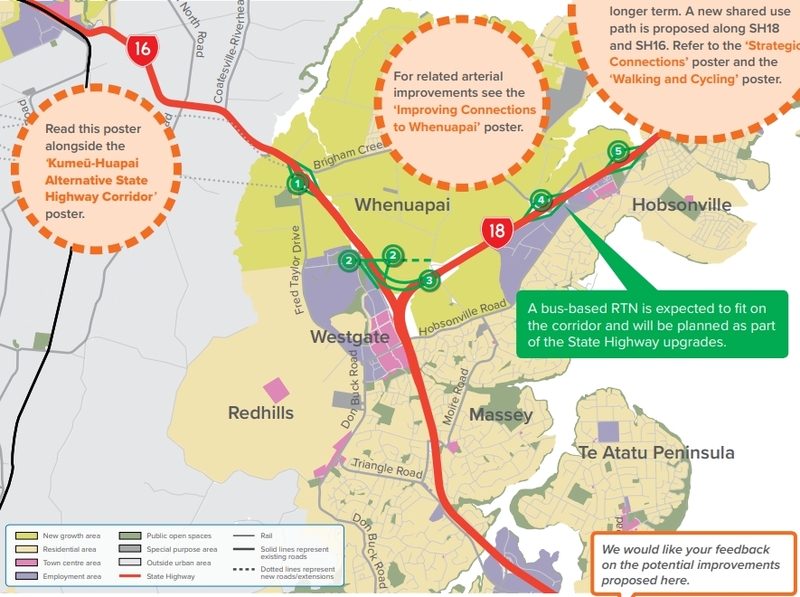 The community lobbied for a bus way on SH16. NZTA’s traffic engineer consultant argued at the BOI, that it was not required, on the grounds that the buses only needed to meet the requirements of a Quality Transport Network route. Of course, his modelling didn’t include any new person-trips due to the additional road capacity, so in reality, traffic volumes quickly interfered with his travel time estimates, and thus with the bus service itself. NZTA have been cobbling together some bus priority to try to get some travel time and reliability along there ever since. That they haven’t learnt from this, and are producing these growth network plans that are still designed around the car is very, very depressing. If there’s one thing that’s the nail in the coffin for a rosy Auckland future, it is this. A couple of quick – and rather obvious observations to anyone living out here at Kumeu/Huapai – (a) there is a perfectly good railway line there, let’s use it now (b) any traffic solution involving emptying more traffic into the north-western motorway, forget it, it just ain’t going to work – that piece road is chocka block now from 6.30 am onwards in the morning, and 3 pm onwards in the evening. The amount of road building in this NZTA proposal will involve indecent amounts of money. It’d be great if someone keen on rail to the NW would look at the cost of reinstating it, together with a feeder bus network and associated infrastructure, and compare that with the above NZTA roading proposal. The roads will exacerbate climate change, and should not be considered a ‘given’. Nor should the business case for rail always be considered as if it must be ‘in addition’ to the roads. Let’s remove the roads from the equation, and then look at the business case for rail. Don’t forget that it isn’t the space on the NW that is insufficient. There’s plenty of space. The problem is the space inefficiency of the vehicles involved. Lanes should be converted to buslanes one after another, and priority given to public transport throughout the NW until travel times by bus are not only faster than by car, but are also low enough to be healthy. So it’s entirely acceptable to design “emptying more passengers into the north-western motorway”, just not in SOV’s.